Vladivostok is Russia's largest port city on the Pacific Ocean and the administrative center of Primorsky Krai. It was founded in 1860. It is situated at the head of the Golden Horn Bay in the southern extremity of Muravyov-Amursky Peninsula. The population of the city is 578 200, of the urban district is 604 900, of the agglomeration is 1 010 000 (20-22 place in the RF). It is supposed that the united municipal formation "Bolshoi Vladivostok" will be founded on the basis of Vladivostok and its cities-companions and Vladivostok will be reckoned with federal "supporting cities". In 2012 Vladivostok will host the 24th Summit of the Asia-Pacific Economic Cooperation (APEC) forum. There are 17 state universities in Vladivostok. Vladivostok has monsoon-influenced humid continental climate. Winter is dry and cold with clear weather. Spring is long and cool with frequent temperature fluctuation. Summer is warm and wet. Maximum amount of precipitation is during the summer months. As a rule autumn is dry and wet. Average annual temperature is +4,6 °C. The warmest month is August with the temperature +19,6 °C. The coldest is January with the temperature -12,6 °C. The highest temperature ever recorded was +34,1 °C on 21 August 1921 and in July 1939. The lowest ever recorded was -31,4 °C on 10 January 1931. 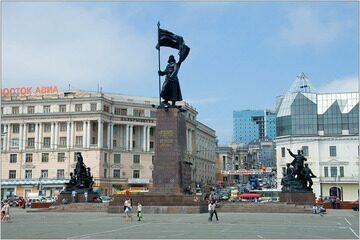 On 4 November 2010 Vladivostok was given the rank of "City of Military Glory".